A few years ago, a huge island of garbage (twice the size of Texas!) was found in the Pacific between California and Hawaii, poisoning the ecosystem and posing a major health risk to fish, seabirds and other marine animals. Like vast icebergs of garbage, as much as 70% of these “islands” lie beneath the surface of the sea. 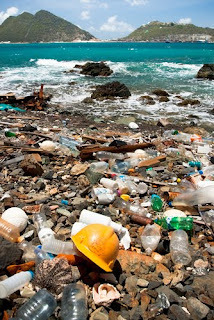 As much as 10 percent of the 260 million tons of plastic produced annually wind up in the world’s oceans. Green technologies that convert plastic to fuel or clothing or more sustainable packaging could give consumers a good reason to pick up all that plastic and make a profit from it … while preventing other environmental nightmares.